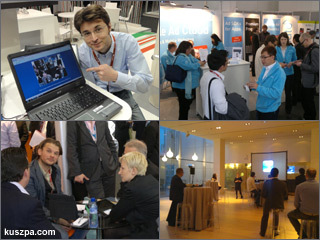 Matthäus in action, me at avinotec booth, smaato booth and apple reception. With your online registration you could use the „fast track“ to get inside the Mobile World Congress – great idea, but also a great surprise if you have to wait 45 minutes in this waiting queue to get inside the fair. But it was just worth it. At the fair there was much to discover and great to meet so many mobile folks from all around the world. Today I had some interesting talks with new contacts from our industry, e.g. with Paul Childs (adfonic) and Guillaume Alabert (mobpartner). At the Smaato booth I met Miriam, Sin, Harald and Jörg, but I also spot Matthäus (Xyologic) in a business meeting by accident in the crowd. After the fair we first went to the Mobile World Congress Apple iAd Reception hosted by Keren Tal and Suzy Hay in the ME Hotel. The ladies gave us some insights on the iAd world and met the German dudes Florian (FriendTicker) and Kristian (VZnet) at the reception. Afterwards we had a nice dinner at the restaurant Xorus together with Annika (netbiscuits).